Watching: J and I finally dove into Ken Burns's The National Parks. Really enjoying it, but man these episodes of long. Listening: Lots of podcasts, but specifically enjoying Pod Save America this week. Making: Registered for 30 Days of Lists in September, so I'm busy pulling my Project Life cards to decorate and use. I've pulled the cards, now on tot he decorating. Feeling: Started getting sick this weekend. Now I have a full blown cold. Planning: Fall Bingo Party is coming quickly! I need to finish putting the final touches on the make n takes and prize bundles. Loving: It's Bout of Books 20! And I'm sick, so not really running out for activities. 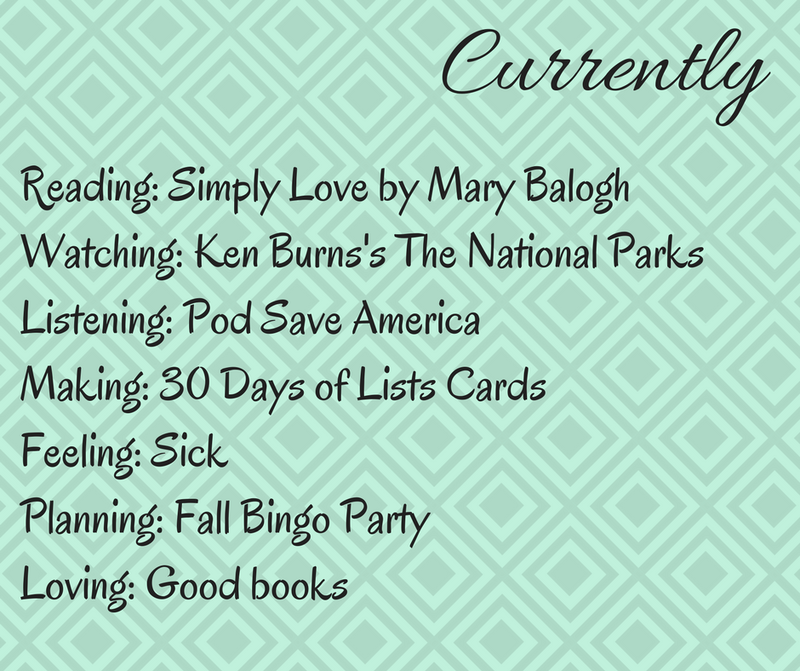 It's the perfect week to read a ton and thankfully I've picked some good books.